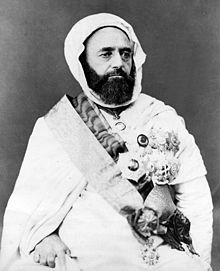 Abdelkader ibn Muhieddine (6 September 1808 – 26 May 1883; Arabic: ??? ?????? ??? ???? ??????? ?Abd al-Q?dir ibn Mu?yidd?n), known as the Emir Abdelkader or Abdelkader El Djezairi, was an Algerian "Sharif" religious and military leader who led a struggle against the French colonial invasion in the mid-19th century. An Islamic scholar and Sufi who unexpectedly found himself leading a military campaign, he built up a collection of Algerian tribesmen that for many years successfully held out against one of the most advanced armies in Europe. His consistent regard for what would now be called human rights, especially as regards his Christian opponents, drew widespread admiration, and a crucial intervention to save the Christian community of Damascus from a massacre in 1860 brought honours and awards from around the world. Within Algeria, his efforts to unite the country against foreign invaders saw him hailed as the "modern Jugurtha" and his ability to combine religious and political authority has led to his being acclaimed as the "Saint among the Princes, the Prince among the Saints"
Paraphrased: Among the degrees of the universal Manifestation, each sentient creature typically experiences an illusory sense of autonomy. At the same time, with or without the creature's awareness, the creature subsists eternally as an "immutable prototype" in the divine Knowledge. The diurnal sun sets at night, but the sun of the heart never disappears. Turn your face toward the sacred Mosque (Koran 2:144,149,150) Commentary: The word "sacred" means that a heart which has not disengaged itself from the sphere of the soul and the sphere of created beings is forbidden to penetrate into this place. . . . "Wherever you are, turn your face" [toward the sacred Mosque] means, "Wherever you are, in the accomplishment of works of worship or in the ordinary acts of life, contemplate Him - in what you eat, in what you drink, in him or her whom you marry, always knowing that He is at once the Contemplator and the Contemplated. . . ."